These fries are so good with salmon patties but they are equally good on their own. Heat oven to 500', make sure it is heated up to 500'. 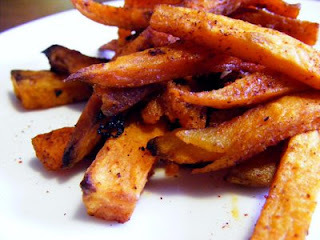 Place fries on a baking sheet, I use my Silpat for this, pour olive oil over fries, I use about a 1/2 cup for 5 potatoes, now salt and pepper to taste, now you will sprinkle chili powder all over the fries. Place in hot oven and bake for 15-20 minutes. The longer they are in the crispier they will be. We like them a little crispy.